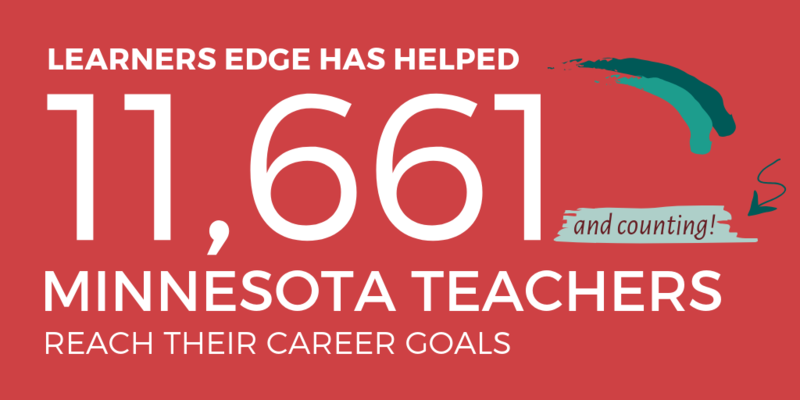 We're here to help Minnesota teachers. The renewal of five-year Minnesota teaching/related services licenses requires the completion of 125 clock hours of professional development that have been locally approved through each school’s continuing education committee. Learners Edge offers both a professional development bundle and continuing education courses to help meet this requirement. 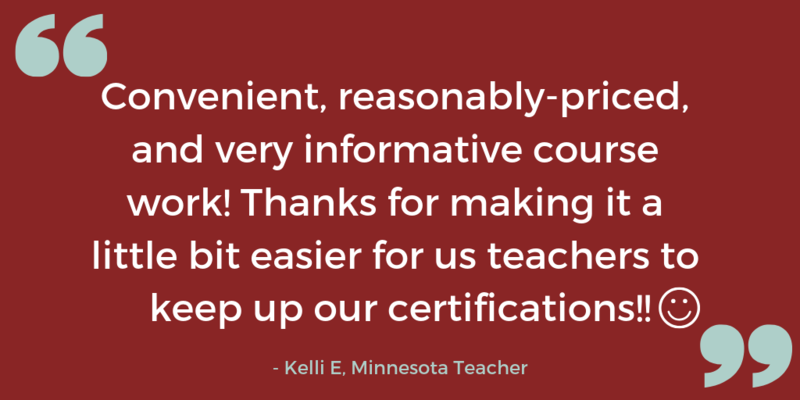 The Professional Development License Renewal bundle covers each of the Minnesota mandatory teaching license renewal requirements. This is an ideal option for those interested in meeting their renewal areas through a convenient online course format, while earning 25 clock hours upon completion. To meet your remaining 100 hours, explore more than 100 continuing education courses for teachers! The teacher licensure structure changed to tiered licensure on July 1, 2018. 5-year standard license—MN has created a new 4 tier- system. Teachers on Tiers 3 and 4 need to meet the state requirements for license renewal. If your license expires on June 30, 2019, apply for renewal to a Tier 4 after January 1, 2019. If your license expires 2020-2023, you will automatically convert to Tier 4. Five-year standard licenses that were set to expire June 30, 2018 were extended to June 30, 2019. If, after this extension, your license now expires on June 30, 2019, you may apply for licensure renewal starting January 1, 2019. After you renew your five-year standard license, on July 1, 2019, it will be converted to a Tier 4 license. Refer to the MN Tiered Licensure Infographic to learn more about renewal. Visit the Minnesota Department of Education website for complete MN educator licensure renewal information and forms. A perfect choice for those Minnesota educators needing to meet their 125 clock hours that includes the mandatory MN teaching license renewal requirements. Ask about our multi-course discount and payment plan options! A perfect choice for Minnesota educators needing to meet their 125 clock hours (includes mandatory MN teaching license renewal requirements) AND gain continuing education credits toward potential salary advancement. The best choice for Minnesota educators that have met their mandatory MN teaching license renewal requirements and are looking for continuing education graduate credits to meet both the MN state clock hour renewal requirements AND earn continuing education graduate credits for potential salary advancement. Learners Edge offers both a professional development bundle and continuing education courses to help meet the Minnesota requirement. The Professional Development License Renewal bundle, updated for 2019, covers each of the Minnesota mandatory teaching license renewal requirements. This is an ideal option for those interested in meeting their renewal areas through a convenient online course format, while earning 25 clock hours upon completion. Read more on Renewal Requirements for Tiered Licensure. Please note: Course components designed to meet requirements for license renewal in 2020 and beyond on the topic of Cultural Competency are coming soon! 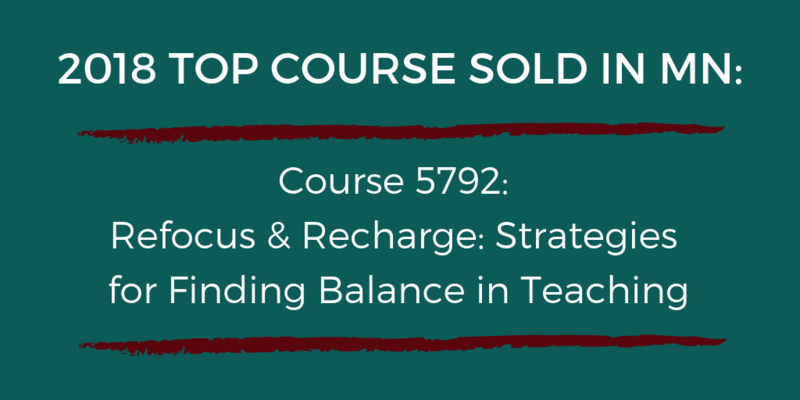 If you just can’t wait or are planning ahead, you can always meet the majority of the renewal requirements with the Hotdish bundle and then take our PD 124: Culturally Responsive Teaching: Awareness to Action. *Individuals who have not taught in Minnesota during the five-year licensure period are exempt from the Reflective Practice Essay requirement. If selecting graduate credit courses to meet your Minnesota renewal requirements, we recommend these great options. 854: Caring for the Mental Health of Your Students - Register for this course if needing to meet the suicide component. Above is a summary of how Learners Edge may help your continuing education and Minnesota license renewal needs. This summary should in no way release individuals from their responsibility of ensuring that the course(s) they take meets their professional needs. We hope it provides assistance in understanding how Learners Edge might help you in the accumulation of clock hours or graduate credit for salary advancement and the Minnesota license renewal process.